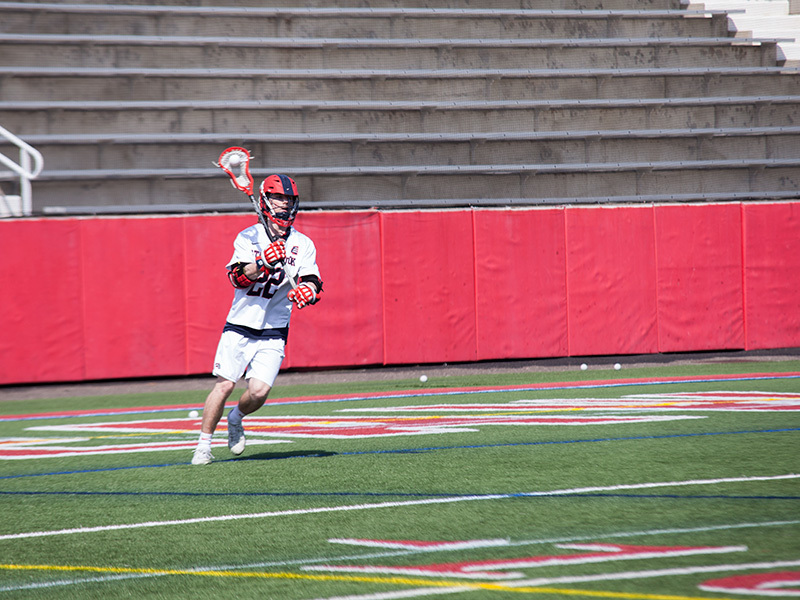 Stony Brook Men’s Lacrosse entered the contest against Brown on Saturday, Feb. 23, coming off a frigid performance against No.4-ranked Penn State on Saturday, Feb. 16. The Seawolves excelled on offense by finishing with eight different scorers and earning the 13-11 victory over the Bears for their first victory this season. Junior attackman Tom Haun led the team with a hat trick, scoring in his ninth consecutive game dating back to last season. Junior attackmen Chris Pickel, Jr. and Connor Grippe scored two goals each alongside freshman midfielder Layton Harrell. Junior attackman Cory Vanginhoven, sophomores midfielders Mike McCannell and Patrick Kaschalk and attackman Jack Walsh also added a goal to the tally. Brown junior attackman Luke McCaleb blasted the shot through the back of the net for the first goal of the game, only 48 seconds in. Haun refused to let Stony Brook get deterred and scored consecutive goals, gaining the lead for the remainder of the game. Harrell earned his first collegiate goal and put the Seawolves up 3-1 with just over two minutes remaining in the first period. Stony Brook carried that momentum over the next two periods by scoring five goals in each. The Seawolves outscored the Bears by three goals in both and closed out the periods with scores. Stony Brook entered the fourth period with a 13-6 lead when Brown freshman attackman Darian Cook became the Bears’ transcendent scorer. Cook capitalized off a turnover and slashing penalty on Seawolves junior defenseman CJ Trenkle with back-to-back goals, cutting the deficit to 13-8 with 7:12 remaining in the game. Less than a minute later, Trenkle found the back of the net again and sparked new life for the once-deflated Bears. Even after Stony Brook defenders blocked the freshman’s shot, Cook still capitalized on the second chance with a score. Cook led both teams with five goals that were all scored in the final period and cut the deficit to two before the Seawolves battled back for the victory. Although Stony Brook outscored their opponents, Brown finished the game by outshooting 38-29. The Bears also finished with more shots on goal and scooped up one more ground ball over the Seawolves, but were unable to successfully capitalize. Goalkeeper junior Michael Bollinger rebounded from his rough outing opening the season by finishing with 12 saves and a 52 save percentage. Stony Brook will return to action against Hofstra in an intrastate rivalry matchup on Tuesday, Feb. 26 at 7 p.m in Hempstead, N.Y.